Baby proofing is big business all over the world, a baby gate is a product which can allow parents to keep their children in a safe area of the house and away from the stairs and away from rooms with dangers such as kitchens, garages and from being able to leave the house altogether. Here at Best For Mums we’ve taken a look at and reviewed over 30 of the best baby gates to bring you a definitive list of 10 to consider. All things considered, we feel that the Venture Q-Fix Extra Tall Safety gate is the best all-round baby gate on the market right now. We recommend considering this one to purchase because it’s made with quality materials that we could trust to keep the baby safe in one location, the lock is very easy to use for parents and impossible for children. The extra height edged it over the competition as it allows the gate to be used for longer when babies become toddlers are more capable of climbing. We have plenty of others to conisder but for us this comes out on top. What is a baby gate and why do I need one? Do I need a baby gate? The Venture Q-Fix extra tall safety gate is one of our favourite baby gates that we were able to review. It’s relatively cheap, it’s easy to install and most importantly it is safe and conforms to BS EN1930:2011 safety standards. As you can see, the USP is the fact that it’s extra tall which makes it an ideal purchase for those who want to use baby gates for a few more years or they have larger pets who you also want to keep in a particular room. We thoroughly recommend considering this one. If you wondered how tall this gate actually is, then it’s 110cm (43.3 inches, 3.6 ft) which is more than enough for even a particularly tall toddler and medium-sized dog breeds. You’ll find that this excellent baby gate will work on doors and hallways 75-84cm which will fit 99% of normal houses. It is pressure mounted with wall cups which means you don’t need any tools to install this bad boy – this will either mean great news as you’re a parent with limited DIY skills or bad news if you have DIY skills and you’re after a more secure solution. The Venture Q-Fix Tall Gate is made using painted steel which is tough and secure with a nice finish which can complement the decor. The design itself is simplistic and no frills and what you’d expect a baby gate to look like. The lock itself is child proof (squeeze and pull back) and one-handed openable for us adults which is essential as often the other hand is occupied by the baby. Because of the height of the gate it’s easier than most gates to open as there’s little to no bending over to reach the lock. We couldn’t really find much of a fault with this baby gate and loved how tall it was. It’s so easy to install and you really don’t need any tools to put it together. We had some concerns over the fact that it was advertised as a “large” pet-friendly gate despite being pressure mounted as a breed such as a German Shepherd would probably make short work of the gate. However, we are reviewing baby gates only here so it’s top marks from us! 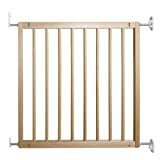 The Betta Care Easy fit baby stair gate is another no frills pressure fit gate to consider as you baby proof your home. The unique difference with this model is that it comes in so many difference widths to suit door openings or corridors up to 147.8cm in width. Otherwise, this is just your average baby gate which doesn’t do anything fancy but doesn’t do anything poorly either! This baby gate comes in five different widths – 75cm – 83cm, 81.4cm – 89.4cm, 107.4cm – 115.4cm, 113.8cm – 121.8 cm and 139.8cm – 147.8cm. The largest one is almost double the size of the smallest so you can picture how versatile this product is. The price ranges from £30 to just under £60 for the largest which is very reasonable and borderline cheap. From the perspective of performance we had no complaints over the at the Best For Mums office with the lock being a doddle for an adult and impossible for our tester tots! It’s made out of the metal you’d expect and it’s rather strong even though it’s only pressure mounted. It could take a fair bit of pushing before any sign of collapsing happened which suggest that this is perfect to keep children and small pets safe in whatever area you need them to be in. A point we’d like to raise as somewhat of an USP is that this gate can be opened in both directions and locked in only one direction if needed. With an optional Bettacare Y spindle kit this bad boy can also be installed on stairs which is a huge bonus if you need to make multiple orders. 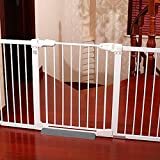 This is a good budget baby gate to consider with a few unique selling points over its competitors. The wide range of sizes make it a versatile choice for those in large houses. The Assure KiddyGuard gate is a stylish choice that doesn’t use the typical metal bars design so it will appeal to those who want their home to not only be baby proofed but somewhat eye-catching, too. The main attraction of this is that it keeps things hidden away if you wanted to add some privacy to either end of the baby gate. The first question we had and you probably had also is what is the gate made of? Well, it’s made of strong mesh capable of withstanding a 100kg impact which is tremendous and a godly feat if it was done by a child. This is not a paper or cloth screen like the image may suggest. This baby gate is screwed to the wall rather than by using pressure so it is very secure. It will fit openings of up to 100cm which is pretty good for a niche and expensive baby gate. This gate has a secure one-handed lock which is impossible to open for a child and a cinch for an adult. You can set it to lock automatically which will give owners peace of mind. If the gate is unlocked a dead obvious red button will stick out. This product isn’t cheap and you can expect a price point of over £50 in most cases. However, this does look, feel and work like a premium product and it does have positive reviews so many people will feel this price is justified. This incredibly stylish baby gate will effotlessly add to your decor while offering you the safety and security of gate. It’s not the cheapest by a long stretch but the product does feel high quality and the price is perhaps justified. The StaySmart Pressure Fit Baby Gate is as simple and cost effective as they come with a simple design, quality materials and a low price point. It’s fairly tall which helps double it as a dog gate (76cm), it’s quick and easy to install even for inexperienced DIYers, easy to open and close one handed, has an automatic close feature if you’re in a rush and has protectors to keep your wall from being damaged. Ticks all the boxes! The width of this gate is 75-82cm which fits 99% of homes in the UK, if you need any more it does have a 7cm extension which brings it to 89cm. The entrance itself (the passageway) is 60cm which is ample but perhaps a tight squeeze for overweight and obese folks. We recommend considering this opening before you make a purchase. We found it just easy as any other pressure style baby gate to install and it took us just 3 steps and a bit of an adjustment for a strong grip on the door frame. The gate has a double teach release which is impossible for a child to open and easy to open one handed for an adult even when carrying a baby. The 76cm height meant it took very little crouching to reach even for some of our taller staff members during the testing phase. Wall protectors come included which is pretty standard. The materials used are white painted steel which feel quality and strong. We tried to push the gate to see if a toddler could force it open and it didn’t budge. A strong large breed of dog could, though, but we aren’t here to review dog gates. There is a minor trip hazard at the bottom as is the case with the majority of these baby gates, this isn’t a defect or avoidable but it’s always worth reminding parents. 【Tall & Large】 The door gate is 76cm tall and 75-82 cm wide and come with a 7cm extension（optional for installing). 60cm wide thru entrance for adults to use even holding a baby. Please measure your desired opening prior to purchase to ensure a proper fit. 【Fast Installment】Simple 3 step installation , place the gate (or with extension if necessary) and adjust the bolt between gate and wall, through Reaction force,the gap of the lock will disappear. Please read the Product Description below before you install it! 【Easy to Open】 Easy Open handle features double-touch release safety lock,only pull and lift handle easily by using one hand so that it is easy for adult but difficult for child.The door can swing in both direction fit for stairs,room,etc. 【Auto Close】 Without forgetting to lock the Gate Since you own a Gate will close itself automatically through gravity. 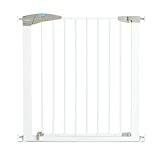 The BabyDan No Trip Beechwood safety gate is arguably one of the best looking and regularly purchased baby gate in our whole list. It is a simply stunning beechwood gate without a bottom bar which gives it a clean opening and as advertised, a no trip hazard. It is wall mounted which allows it to be sturdy enough to not need support. If you’re a homeowner and are able to use the wall fixing and the wood effect is to your liking then this could be the best baby gate for you! The dimensions of the BabyDan Beechwood Gate are 78.5 x 3 x 71.5 cm which is pretty much the same as most baby gates. The beechwood is smoothly finished with no splittings and splinters. The wood is well crafted and it looks professional. Support beams are absent from the product as it is wall mounted for extra strength this makes the product look like it ‘belongs’ to the home as opposed to being added to it. Although the images don’t look like it, it has a one-handed opening lock which is easy for an adult and impossible for a baby and conforms to all European safety standards. When not in use the gate can actually be lifted away and stored as it only needs the wall fixings making it ideal when no kids are around. The wall fixings and the strong would make it sturdy and does not budge even with quite a bit of pressure. Although this is strong enough for even medium to large size dogs the wood finish makes it easily scratched by their claws and not a good dog gate. You can install this inside or outside of a door frame. The wood effect makes this gate the choice that is most likely to enhance interior decorations and along with its strength is it uniqe selling point. The BabyDan Beechwood Gate is one of the best looking baby gates on the market. It’s not just style though as it also doubles as a strong, reliable gate with no trip hazard and a one hand lock. Definitely check this out! No Trip Safety Gate made from 100% European beechwood. Opening measurements: 72 - 78,5 cm (28.4" - 30.9"). 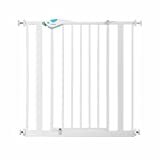 The Dreambaby Chelsea Safety Gate is a good all-rounder pressure installed baby gate with all the features you’d expect with a purchase like this. The performance is good and the design is slightly different with an arched top. With two colours available and a wide range of sizes the dream baby gate is a product which can suit a wide variety of spacial needs in the home. The four sizes available are 71-81cm, 71-98cm, 97-106cm and 97-133cm which is rather broad, especially the largest version which reaches a whopping 133cm. They are all 75 cm tall which is pretty standard. The screw pressure corners are pretty standard and work pretty well, the grip is tight and the gate can take a considerable push. It conforms with European standards and we’d have no problem with this in our house protecting our little ones. It has a one-handed lock which is a doddle for all the mums who tested this model. Not a single one of our children which included some toddlers could crack the lock. Not even close. There’s an ‘ezy-check’ indicator which lets you know if you’ve forgotten to lock it. This can also be used to let you know if it’s been installed properly and not on a slant or anything. On top of this, the Dreambaby Chelsea Safety gate has an auto lock feature just in case you’re rushing about! The material is metal as you can probably guess which is tough and reliable. It’s got a pretty standard white or black paint. The black is probably our favourite as a standalone product but it never quite seems to suit any house decor! Some may think this is an also ran baby gate but with the choice of black or white and a few different sizes available that other choices don’t this could be the best baby gate for those with different sized openings in the home. MEASURE YOUR OPENING BEFORE PURCHASING - This gate ONLY fits openings 71 to 80 cm. It will not fit any opening smaller than 71 cm. If your opening is larger than 80 cm you will require an additional purchase of an extension. ONE HANDED OPERATION - The One-Handed operation is fantastic for times when you're holding your child and the double locking feature ensures extra security to help keep your child safer. EZY-CHECK INDICATOR AND AUTO-CLOSE- For added security, the EZY-Check indicator will help you identify your gate is securely locked with just a quick glance. **Tip: It also helps indicate your gate is properly installed. It has the convenience of Auto-Close, which ensures constant and reliable safety of a gate that closes automatically from any distance, every time. The Lindam Easy Fit Plus Safety Gate is a mother and baby silver and practical parenting and pregnancy 2009 award winner for safety and practicality which should go a long way to put you at ease about the quality of this product. You might be thinking that 2009 was a long time ago now and the awards aren’t really relevant anymore – well, the product didn’t need to change so from our point of view the awards are still a great mark of quality. If you want your baby gate to thoroughly tested then this is the one for you. The Lindam Easy Fit Plus Safety Gate dimensions are from 750mm x 765mm x 45mm up to a maximum 810mm x 765mm x 45mm. The width is the only number that changes. The gate comes fully assembled out of the box which means minimal fuss for the recipient and a much better time if you’re a single parent with limited DIY skills. This is a pressure cup gate which means there’s no drilling or screwing involved. The frame has a special U-frame which makes the gate much easier to open and close both ways with minimal effort. If you’re carrying a baby in one hand and want to pass through this becomes a breeze. The dual-action opening system is the USP for the gate and probably what won all those awards back in the day. Indeed, this gate has a very solid frame and a secure lock which is impossible for a baby and easy for an adult. Lindam is a world class manufacturer of baby products, not just gates, and you can clearly see some thought has been put into the design of the gate. Safety is definitely the buzz word with this product and we would recommend if it’s safety and peace of mind you’re after and you’re willing to pay slightly more for it then this could be the best baby gate for you. This baby gate has won awards for its safety and we agree with them. This is one of the safest baby gates on the market and perfect for those who want the peace of mind that no child shall pass this gate! Time for something a bit different we think. The Summer Infant Retractable Gate is one stunning piece of kit which will suit people who have modernised their homes and don’t want the classic white metal bars look that baby gates tend to have. And the best thing about it? This gate is just as safe and secure as any other gate and it won’t cost the earth! This stylish retractable gate is wall mounted as it doesn’t have a bar that goes from left to right. This means two things – one, it’s more secure than pressure mounted gates and two, it means that it’s a lot more discreet when not in use. You can use this at the top of the stairs and in between rooms. It is 76cm tall (standard height for any gate) and can extend to a width of 127cm. Always measure before making any sort of purchase and ensure walls are suitable for hardware installation. 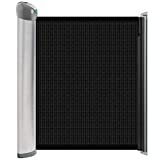 The gate itself is made of durable mesh which is the same as the other mesh gate we reviewed, except this one has been patterned and comes in a different colour. It sounds like very little but the decorative pattern really does make a difference to the decor of the room it’s installed in. The mesh is finished off with charcoal accents and a silver satin finish. It’s not instantly obvious as Summer Infant doesn’t mention it but this baby gate is not a trip hazard thanks to the hardware installation. To top it off, the gate has a simple lock which is easy for adults and impossible for children. To open, you simply slide to the left. Something it lacks though is that it doesn’t have auto lock – you will have to manually close it after yourself. The mesh is strong enough to withstand any pressure a child or toddler will throw at it but a large dog may give it a run for its money. However, we aren’t here to review pet gates! This is easily the best looking baby gate that is not just a looker but one that is practical and functional too. It’s not cheap though. The Aubert Concept Baby Barrier is our newest arrival baby gate which uses traditional bar styling while being wall mounted with screws. This allows potential barriers to have best of both worlds if they’re just after a simple one that has the strength of one that’s screwed in. It’s not cheap, though, but we feel it does justify the price tag. The Aubert Concept Baby Barrier is made using strong metal (steel) to keep your baby and pets at bay wherever you install it. It’s cold to touch but very smooth and easy to grip. The styling is very minimalist but precise. The barrier has been designed for strength and durability and was not able to be topped even with quite a vigorous shove from adults, therefore a child and even a moderately strong dog would not be able to get past this. You’ve got three metal colours to choose from – black, aluminium and white. White being the standard that most are familiar with and the black/aluminium offers something a little different. The length (without extension) is 72-78cm and goes up to 84.6cm with an extension. Pretty standard stuff. The extension is included. This barrier opens both ways easily and effortlessly with the very sought after feature of auto locking. The lock itself has double locking which enhances its ability to not be opened with repeated tampering by cheeky little tots. This barrier can be opened one handed which is essential for busy parents who often want to walk through while holding their child.This is designed to be used with children 2 and under. Length without extension: 72-78 cm, length with extension: 84.6 cm. Last but perhaps not least is this hidden gem we found ourselves and one we manually outreached to for a tester gate. 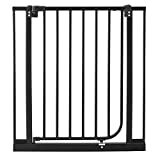 Welltobuy has filled in the name of the product with loads of keywords to appear better on Amazon so it doesn’t have a catchy name, it’s “Baby Safety Gate Fence Indoor Stairs Door Gate Baby Door Bar for Infant Pet Dog Gate Fence”. Anyway, why is this a hidden gem? Well, it’s because it does the job and you can get it for just a tenner! (£10) at time of writing. Whoah. This gate is a pressure installed gate and measures 46*13*4cm/18.11*5.12*1.57in which is the same size as the vast majority of its competitors. It’s made using spray painted plastic (not metal) which does feel a little cheap but not the point where it hampers the performance of the product. It isn’t quite as strong as metal, obviously. Plus, the product is actually cheap anyway. It’s easy to assemble and install even for amateur DIYers. There are two basic colours to choose – white and grey. This baby gate does not have a unique selling point outside of the incredible price tag. In saying this, the Welltobuy baby gate also doesn’t have anything obviously wrong with it either. It opens up easily with one hand, it’s impossible for a child to open and there’s even a safety ramp to reduce the chances of tripping over it. It definitely doesn’t LOOK like one of the best by a long shot. 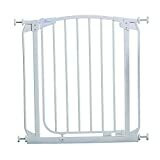 The Welltobuy Baby Gate is the cheapest baby gate but clearly not the best. An ideal solution for those who need a quick fix on the cheap. The Safety Gate is suitable for any place: walls, stairs, doors, kitchens, etc. The protector adds convenience and safety and the slide fixing sheet, it is convenient to pass. Size: about 46*13*4cm/18.11*5.12*1.57in . fixing sheet, used for indoor door bar, baby door bar, pet fence, etc. Easy to install and disassemble, Only make the bottom of the door bar stuck in the middle of the guide sheet. A baby gate is a name for a plastic or metal gate which is placed in hallways and doorways as a method of baby proofing. A baby gate is used by parents to stop (or allow if needed) access to various rooms and areas of the home which could be dangerous if they were to go there without supervision. Examples of use are to stop a baby from being able to go anywhere near stairs, to stop them from being able to get into a room with dangerous tools and equipment (garage, kitchen), to segregate them from pets and so on. Basically, a baby gate is there to stop them from being able to go to an area you don’t want them to go to. A baby gate is made out of either plastic or metal an can be constructed with bars or as an opaque or solid sheet. A baby gate can be installed via drilling into the walls/doorway or by using pressure screws which can be removed without any damage. The gate will have a childrpoof locking mechanism which must conform with EU regulations to be able to be sold – this mechanism will be impossible to open for a child and easy for an adult. The exact workings of the lock will vary from product to product. Never make a rushed or uninformed decision when it involves your child’s health and safety! Once installed, the baby gate absolutely has to be easy to use for the parents and impossible to use for the child. We’re talking simple locking mechanism that’s not fiddly and can ideally be opened (and closed) with one hand as a parent may often have the child held in the other. If a baby gate is too fiddly then it wouldn’t be in our top 10 list at all. For us to grade a baby gate as the ‘best’ then it is our opinion that the baby gate will need to be easy to install by a single person with little or no DIY experience to receive top marks. However, this doesn’t necessarily mean that baby gates that need to be manually screwed into the walls aren’t good baby gates but they will not be pushed to single parents and the like. We are absolutely not interested in advertising grossly expensive products to our readership just for the sake of it. Just like any of our other product reviews, to be a decent product it needs to have a good return on investment. This doesn’t mean that the cheapest is always the best or that an expensive product will never be recommended! It’s all about striking a fine balance between cost and quality. When you’re a new mother you begin to realise that many companies out there see you as walking dollar signs who hope that they’ll buy anything they put in front of you because it’s for your baby’s safety and therefore a necessary purchase. A baby gate is one of those products. nope never had one – in the house we lived in when DD1 was born we could close the door to the hallway, and when we were upstairs i just kept an eye on her, she never seemed that interested in going downstairs on her own. So, as you can see from just a couple of quotes that there’s two sides to the debate. At the end of the day, you do what you feel is right for you, your babies and your home. To read the whole debate head on over to Mumsnet. Kate is a mum of three - two boys (11 and 5) and one girl (3) and has been a contributor with Best For Mums for a number of years now starting off as a moderator on the Facebook group. Kate is an English teacher from Huddersfield by day and a Yoga instructor by night. You can get in touch with Kate by emailing kate@bestformums.co.uk. Copyright © 2019 Best For mums. All rights reserved.